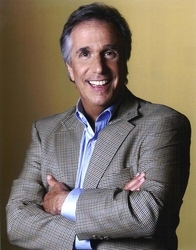 Henry Franklin Winkler is an American actor, director, producer and author. Winkler is best known for his role as Fonzie in the 1970s American sitcom Happy Days. "The Fonz", a leather-clad greaser and auto mechanic, started out as a minor character at the show's beginning, but had achieved top billing by the time the show ended. He currently stars as Sy Mittleman on Childrens Hospital.